I have a strange behavior today. 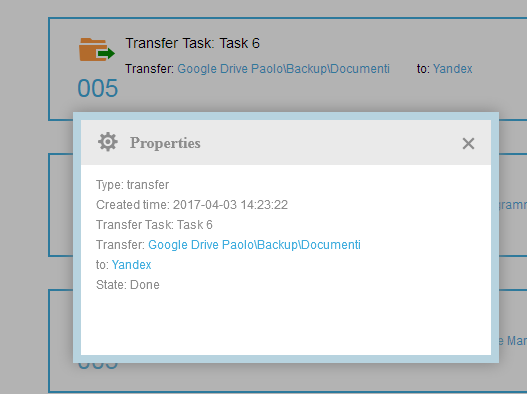 I have a task that transfers the directory documents from google drive to yandex disk . Early this morning, I moved the google directory documents into another directory, so it bacome a subdir. It was an error so I brought it back to the google drive root later. After, I started the transfer job and all new files were trasferred ok. I didn't modified it, I cannot because I've a free account. There isn't such backup directory there. I still have the directory documents under the google root. If I click the link in the task options, it bring me to an empty location, that's right. To check, I put a file (A, an image) in my googledrive\documents directory and I started the task again. I supposed that it wouldn't have transferred anything because the starting point it has is from the wrong location, i.e. googledrive\backup\documents. But it counted correctly all the files and then transferred only the new file A to yandex. bacome a subdir. It was an error so I brought it back to the google drive root later. When you moved the documents into another directory, what's the status of the task? Was it running when moving it to another directory? Could you please send the screenshot of it to us so we can analyze it? Did you mean the "Backup" folder was created by MultCloud? If so, did you use the "Cloud Transfer" feature? Please send the screenshot of it to us. we find you did create task for googledrive\backup\documents. Please check it. Please go to the official website to check it and confirm where is it. no, I did it within google drive web app. No task running then. - multcloud adapted itself to the new situation to continue working? @Paolo, I confirmed this problem with my colleague who is a developer and he told me that MultCloud could not create the "Backup" folder when transferring your files. So please delete old tasks you do not need and create a brand new transfer task to transfer your files. Hi, thanks, I'll do that.